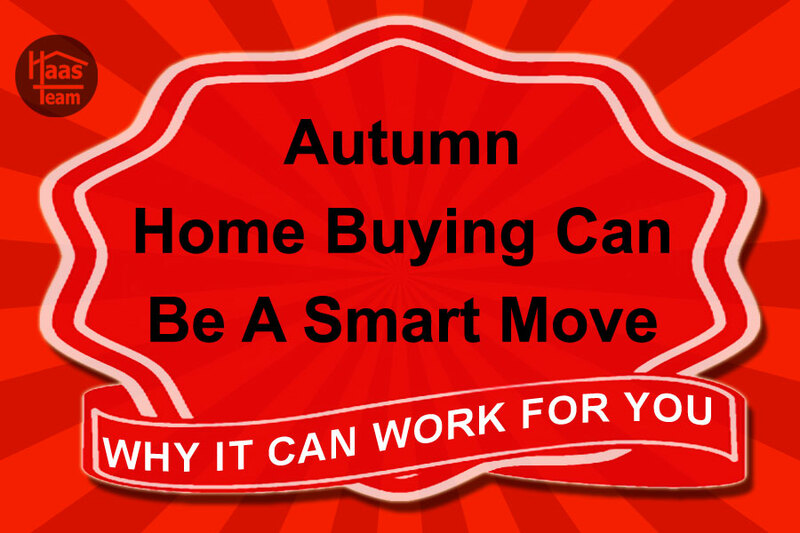 Yes, Fall is a great time to purchase a home. This year in particular, you will have more homes to choose from and less competition. The following is an article from "Realty Times" that gives some reasons as to why Fall home buying may be a smart move. Yes, there may be fewer homes on the market, but there are also fewer buyers out there competing for the same home you want. That gives buyers an important edge. "Families on a mission to move into a new home before school starts are out of the picture," said Forbes. "Competition for houses drops off in the fall, a time many people consider to be off-season in real estate. But there are still homes for sale - and in some cases, there's just as much inventory as there was during the spring and summer." The benefit to sellers is that those buyers who are out there tend to be more serious, which means yours REALTOR® can key in on the real buyers without having to sift through the riffraff. If you're a buyer who closes escrow before December 31, and you may get a nice write off on your taxes. "Property tax and mortgage interest are both deductions you can take for your whole year's worth of income, even if you closed on your home in December," David Hryck, a New York, NY tax adviser, lawyer, and personal finance expert told Realtor.com. "Any payments that are made prior to the closing of the loan are tax-deductible. This can make a serious difference in the amount you owe the government at the end of the year." There are also potential tax breaks for home sellers. "You can include all sorts of selling expenses in the cost basis of your house," said The Balance. "Increasing your adjusted cost basis decreases your capital gain because this is what's subtracted from the sales price to determine how much of a gain - or loss in some cases - you've realized. If you have less of a gain, you're more likely to fall within the exclusion limit, and if you're gain isn't excluded, you'll pay taxes on less." And that's just the beginning. Closing costs and home improvements may also be write offs for sellers. Check out the full list here. Buy or sell early in the fall and you could be nicely situated in your new home in time for the holidays and before winter weather hits. Moving during a calmer time of year also means you may have better access to movers and other necessary resources than during the busier spring and summer seasons. Did you list in the spring or summer with an exorbitant number that you thought you'd have no trouble getting because it was a hot market? That's pretty common these days. Whether you've had a revelation about the price you should be asking or have made updates to your home to justify a higher price, you're probably in better shape to get your (realistic) asking price in the fall. If you're a seller and you establish a smart pricing strategy, you could find your home standing out in the crowd and selling while others sit on the market under a blanket of snow. Buyers also may have a better time getting a home that's within their budget because when there is less competition for homes, there is less chance of bidding wars and over-asking-price sales. Here's something you may not have thought of. "Did you know that burglars have peak seasons? They do, Sarah Brown, a home safety expert for SafeWise.com, told Forbes. "July and August are prime months for burglaries to take place. Waiting until the fall [to buy] gives you an advantage when learning about a home and the neighborhood. You'll be settled in your home and can take precautions—like setting up that new alarm system—before the next burglary season rolls around. For sellers, less competition for your home can be a good thing if it means your home is safer from theft. Coordinate the timing right, and those items you need to fix up your home for sale in the fall or update and upgrade after a purchase might be priced to your advantage. Check Consumer Reports for a full list of the best times of year to buy everything, and keep in mind holiday and Black Friday sales. You could score some great deals at this time of year.